This article is for teachers at early learning services. We don’t charge parents and family members anything at all. Read what Storypark costs for early learning services, here. When you sign up to Storypark for the first time you’ll automatically have free, unlimited access for 30 days. You’ll be free to add as many children as you need, create unlimited stories, plans, notes, posts, conversations and comments, and invite anyone you’d like to share the trial with. Basically you'll have unlimited access to all features. At the end of the free trial, in order to continue using Storypark you’ll need to upgrade to a paid account, based on the number of children you wish to add. Don’t worry, if your trial is about to end, we’ll send you a gentle reminder. 1. Click on settings icon at the top of the page. 2. From the drop-down menu, select ‘Account’. 3. On your 'Account' page, you'll see how many days left you have on your trial. 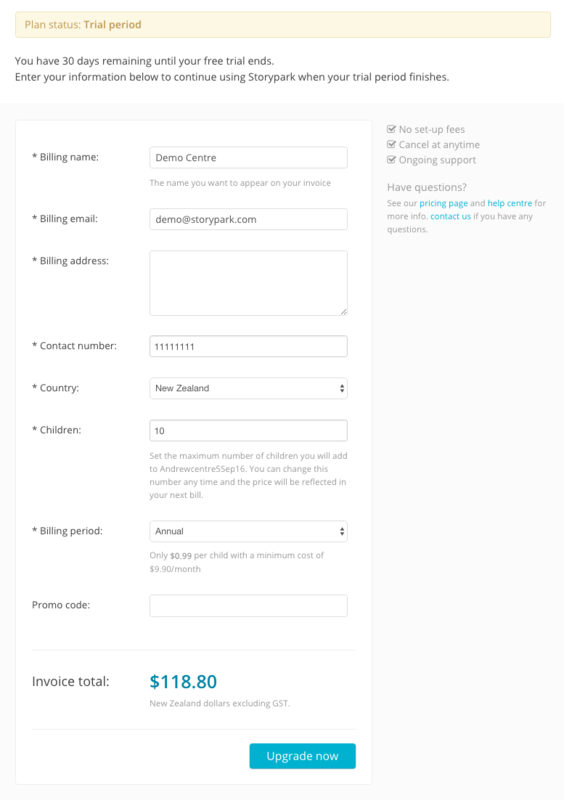 At any time you can fill in the form to upgrade to a paid plan, or email us at sales@storypark.com. You'll receive an email with your first invoice, and payment details. What happens to parents and family access if your trial expires? Because Storypark is free for parents and family members, any you invited will be able to continue using Storypark for free even if you don’t wish to continue.